Made-up holiday or not, today we honor all the good mothers who raised us. 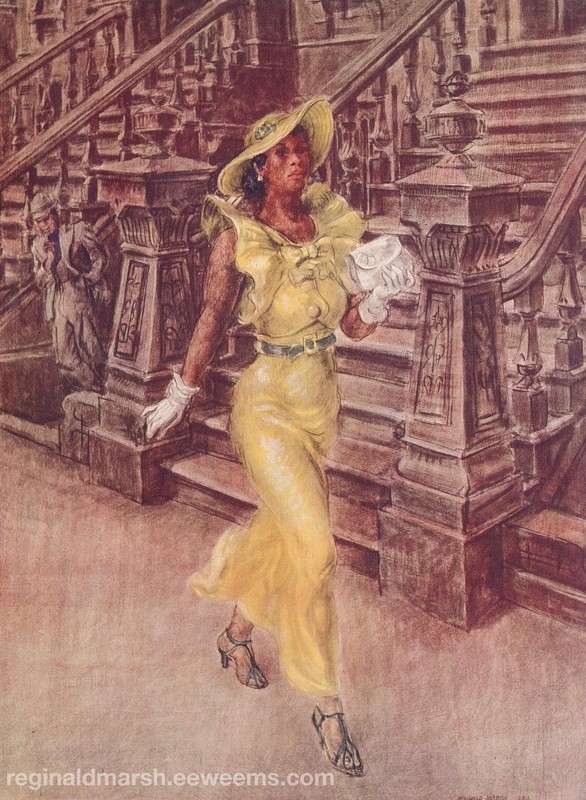 This story was originally written for Patti Abbott’s charity challenge, and was inspired by a 1930’s Harlem painting by Reginald Marsh. (Incidentally, Marsh lived in an artist colony in my hometown of Nutley). Happy mother’s day, here’s a real mother for ya. When her boy Lewis didn’t come home that evening, Caldonia Peele prayed he wouldn’t break her heart. When he didn’t slink in weary-eyed in his slept-in clothes that morning, her chest fluttered with worry. But when he didn’t tiptoe into church, her heart went cold. “He’s at the age, Callie,” Mabel said. They both worked at the Harlem post office. Seen each other through three husbands, four children, a riot, and a burst appendix. Caldonia and Mabel navigated the Convent Avenue throngs after church. Had to get to Sylvia’s quick if you wanted a table. Their children walked behind them in their Sunday best. Jerome, Mabel’s second husband, walked alongside. Lewis Senior was gone five years now, same as Mabel’s first husband. Hard times drove men to gambling and drink, made them quick with their hands. Nettie’s was by the Hudson, tucked behind a mechanic shop that had sold black market tires during the big war. Caldonia walked with purpose, face firm and lip curled. Angry her boy had been lured astray. Soon as her boy turned thirteen, his eyes were tugged to their corners by the sight of rough men on stoops, calling out to women walking by, whistling at the fancy cars rolling down Broadway. Looking for a man to fill the hole his father left. Maybe Lewis missed the hard knuckles and cruel smiles. The jukebox shook the clapboard walls outside Nettie’s. A fat man perched on a stool by the door, like a stout mushroom after September rain. One wooden leg and two mismatched shoes. Alf Nettis shook his head as Caldonia strutted to the door. The alleyway was filled with bald tires and trash. Only way in was through the door. Or maybe the car shop. Caldonia pointed her chin that way. “Maybe you prayed, your boy’ll be home when you get there,” Alf called. Caldonia felt her slender fingers turn to fists. She spun and stomped to an inch from his face. His sleepy eyes had skin tags around them like flies, swatted by his girlish lashes. They blinked. “He says the Lord helps those that help themselves,” she said, and sashayed past. The joint was crammed with hunched-over men nursing dirty glasses, a low buzz of mutter and chuckle muddling the ears like the scent of unwashed bodies and whiskey did the nose. There was a brief silence as drinkers assured themselves their wife wasn’t the one invading the place. The bartender, lean as his brother was fat, sneered and wiped out a dirty glass with a dirtier rag. She paid them no mind and ducked out the back door. The caged-in yard was a mess of lawn beaten down by feet. Cat Ferris sprawled in a Chrysler’s leather bench seat planted in the grass, resplendent in his turquoise suit. Before him, Lewis ran dice for three men huddled over a slab of slate. Lewis wore his Sunday shirt and shoes, suit coat folded beside him. The dice men laughed, and Ferris leaned back, baring golden fangs. “Your boy’s a man now, Mrs. Peele. He’s about to run off like his father did. Man can’t take a six-foot hellion telling him what to do.” He took a long pull at his can of Rheingold. Caldonia’s cheeks went to stone as she saw her boy blush. She slipped the .32 from her purse and fired, punching a ragged hole in the seat by Ferris’s crotch. Ferris kicked and squirmed into himself, spraying himself with beer foam. A dark stain spread across his slacks. Before the report was done echoing off the tin roof, the dice men had snatched their bills and scattered. Lewis huddled in the grass, hands covering his head. Lewis threw on his jacket, straightened his tie. Caldonia offered him her arm, and they walked out primly. Thanks for inspiring me to write it.